Water purity is critical for a number of industries such as pharmaceutical and semiconductor manufacturing and power generation. The presence of bacteria and other organic compounds in the water can suggest a failure in filtration, storage and other components and systems. Left unfiltered, these compounds can create significant challenges, from damaging expensive industrial system to negatively impacting product quality and threatening profitability. Detecting the presence of these organic contaminants and quantifying their concentration can help protect consumers, industries and the environment. For this post, we will focus on how pharmaceutical organizations address these organic threats. Organizations such as the United States Pharmacopoeia (USP), Japanese Pharmacopoeia and the European Pharmacopoeia have made Total Organic Carbon (TOC) analysis the standard test for quality when it comes to water purity and water for injection. The USP has gone as far as making TOC water monitoring a requirement at all stages of the pharmaceutical industry. TOC is the measure of the level of organic molecules or contaminants in purified water. TOC is an analytic technique that helps organizations understand whether the water they are using is pure enough for their processes. All water, no matter how pure, contains some carbon materials. Many of these materials are introduced into the water from the water source, or from materials and systems during purification and production. They can also come directly from workers involved in the processes. They may include natural or altered products of living systems or man-made and synthetic compounds. 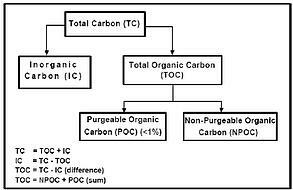 What are the Components of TOC Analysis? There are three parts of TOC analysis: sampling, oxidation and detection. To meet required regulations, it is recommended the sampling system have automatic sampling, acidification, and sparging for TOC analysis, automatic dilution capability and autocalibration using a single stock standard in order to improve reproducibility and increase throughput. Studies suggest that the combination of the Persulfate with the heat and UV light produced more accurate and faster analysis. Why is it Important to Measure TOC? In the pharmaceutical industry, high purity water is a key ingredient used throughout the production processes. Ensuring that the purity of the water helps to eliminate the impact that bacteria and other organic compounds may have on product quality. Organic compounds combine with other elements to produce molecules that can prove harmful to products and to the environment once the water is discharged. In addition to water purity levels, TOC analysis can also provide validation of the cleaning methods companies use for maintaining drug-manufacturing equipment.